This worry free investment will last for years. 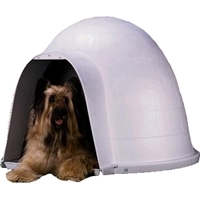 Structural foam plastic construction helps pets stay warmer in winter and cooler in summer. Clean-up is just a little soap and water. Features top ventilation, top latches to base. Optional doors and pads are available for all 3 sizes of Indigo. Perfect for those rough weather conditions! This home features the classic igloo shape, which promotes good heat circulation, and stability in windy conditions. The home also features an adjustable top ventilator. 5 year manufacturer's warranty. 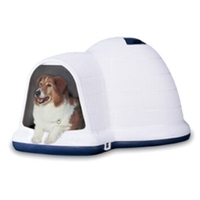 This barn-shaped pet shelter has rear air ventilation, a rain diverting rim, and raised interior floor. The house also features structural foam construction. One year manufacturer's warranty. This size is good for Dalmatians, Labrador Retrievers, and Boxers. 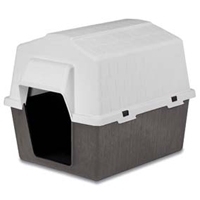 This barn-shaped pet shelter has rear air ventilation, a rain diverting rim, and raised interior floor. The house also features structural foam construction. One year manufacturer's warranty. This size is great for Chow Chows, and Whippets.